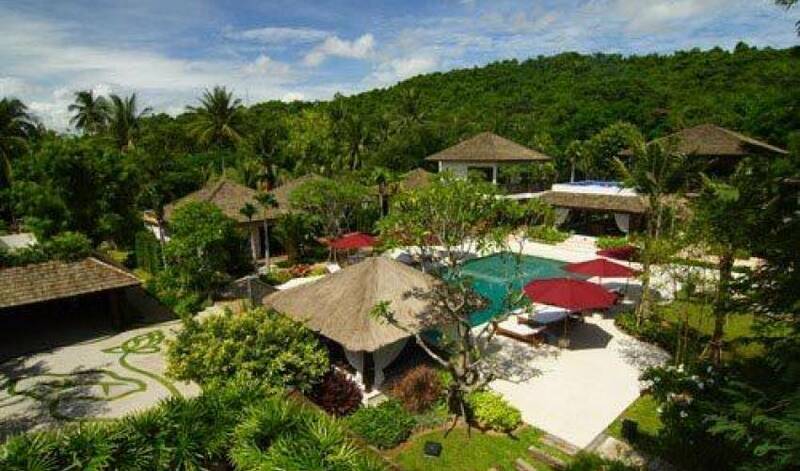 This villa is a unique ultra-private resort with luxurious amenities and features that has been painstakingly designed and appointed to be the perfect destination for a large family & friends holiday gathering, a secluded place to escape to, either alone or with a special friend, or an ideal venue for a fully serviced corporate or institutional outing or event. 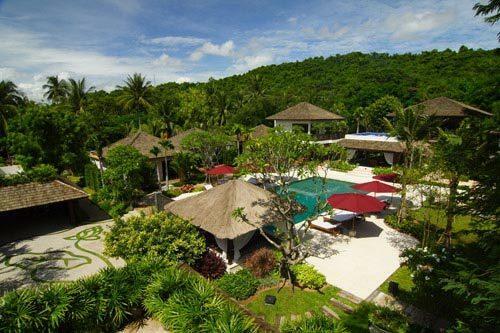 The exquisitely designed compound and villas are inspired by Balinese style and a fusion of Asian art & architecture with a focus on luxury and comfort. 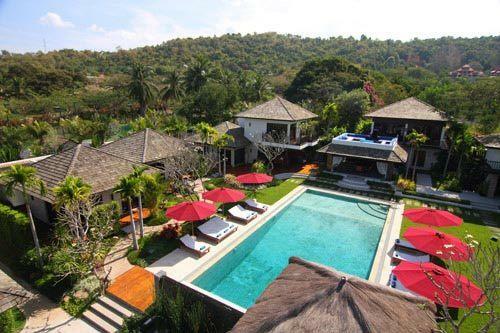 Nestled within the exclusive gated community on the foothills and surrounded by lush gardens and tropical landscaping, the property boasts magnificent views overlooking the picturesque Bangsaray Village coastline and outward to the islands dotting the horizon. Don’t let the peace and tranquility of the villa give you the wrong impression either.then estate is in the heart of a dynamic tourism development area that includes both secluded and full-activity beaches, marinas, water sports, 10 fabulous golf courses to choose from horseback riding, elephant safari, tiger zoo, crocodile park, water park, go-karting & paint-balling, traditional thai cultural shows, national parks, botanical gardens, mountain bike trails, eco-tourism areas – you name it – and all within a short drive. Enclosed within its own secluded compound and with plenty of spacious accommodation for up to twenty guests, sharing 9 beautifully-designed bedroom suites, villa 4211 is the perfect solution for those seeking privacy, luxury and highly personalized services; whether as an individual, a couple, an extended family, or a group of executives needing to unwind. The beach “Sai Kaew Beach” or what is often described as “The Navy Beach” – is a semi private beach within the Thai Navy Officer’s compound, which has granted special entry rights to our guests; and which offers the perfect combination of privacy, solitude, tropical scenery and exquisite beach and swimming. This is the choice beach for most guests staying at the villa and probably one of the finest beaches in the entire Eastern Seaboard Region.The beach is a fun and beautiful ride through the Royal Navy Academy grounds, and up over the hills facing Monkey Island, with its beautiful panoramic views of the ocean and the islands which dot the horizon. 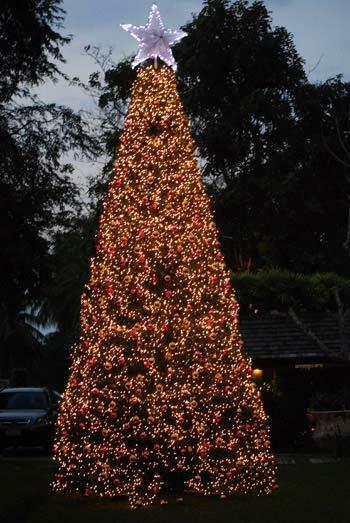 Phoenix Golf Course : There is also a total of 17 golf courses within 40 minutes drive of the villa and situated just 10 Km to the east of the villa along a winding road passing hills and lakes is the Silverlake Vineyards which covers an area of 480 acres and is the life’s work and passion of Khun Surachai Tangjaitrong, one of Thailand’s pioneers in the art of growing grapes and producing fine wines. 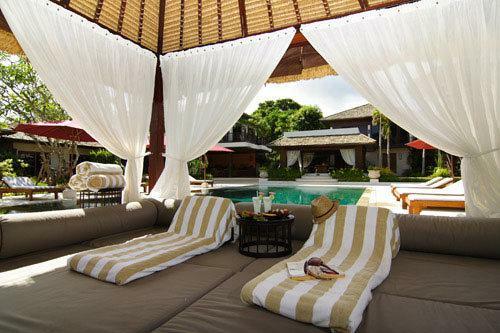 There are many different lounges and salas contained with in the villa, these are listed below. The Spice Lounge: warmth and comfort abound in this open-air living room, adjacent to the Dining Pavilion and overlooking the pool and patio. The Sunset Lounge - is a spectacular roof terrace above the Dining Pavilion, open to the warm Thai sunshine and endless blue skies, with great views of the entire estate. Thick cushioned benches on all sides and a large Ottoman in the centre are designed for luxury lounging at sunset and star gazing by moonlight. The Lava Lounge is on the ground floor of the Main House. Featuring a 62inch cinema display and ample sofa seating, remote control electronic black out curtains and acoustic ceiling, this room provides the perfect environment for the ultimate in viewing and entertainment pleasure. 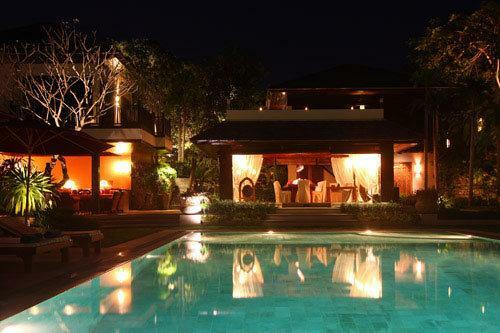 The Dining Pavilion - just below the Sunset Lounge is the main covered dining area, overlooking the pool and adjacent to the Spice Lounge. This elegant space seats up to 24 people, 16 at an enormous solid teak rectangular table and 8 more on a matching oval table, both provided with luxurious upholstered wooden armchairs. The Dining Sala - is the alternative open air dining area overlooking the lake and the Buraran hillside that is frequently selected by guests for breakfast, early morning meditation or as the ideal venue for daytime meetings. This entirely wooden Thai style structure also sits at the far end of the water garden, offering privacy away from the main activity areas with eye pleasing views in all directions. The Massage Sala - is a unique feature of this villa, being a stand-alone, fully-enclosed, Balinese-style sala (room) that has been equipped to accommodate up to four guests at one time each on special massage mattresses. 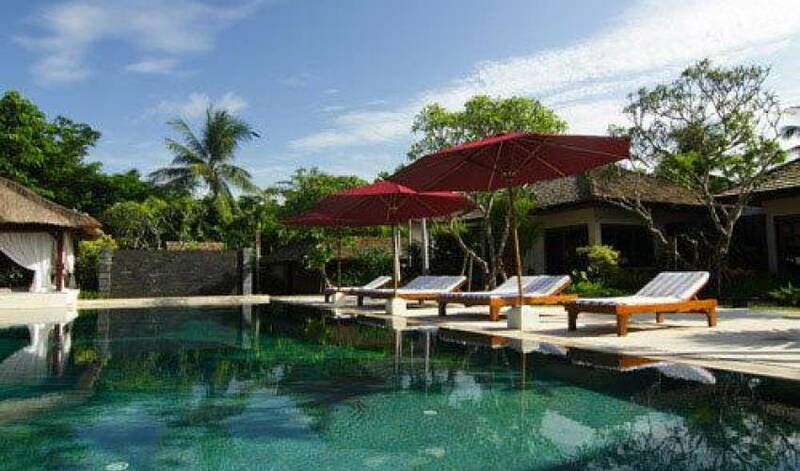 The Pool Sala - on the other hand, is a more modernistic Balinese sala located in the midst of poolside activity, providing the ideal place for an afternoon nap, poolside massage or simply to get away from the blazing sun. 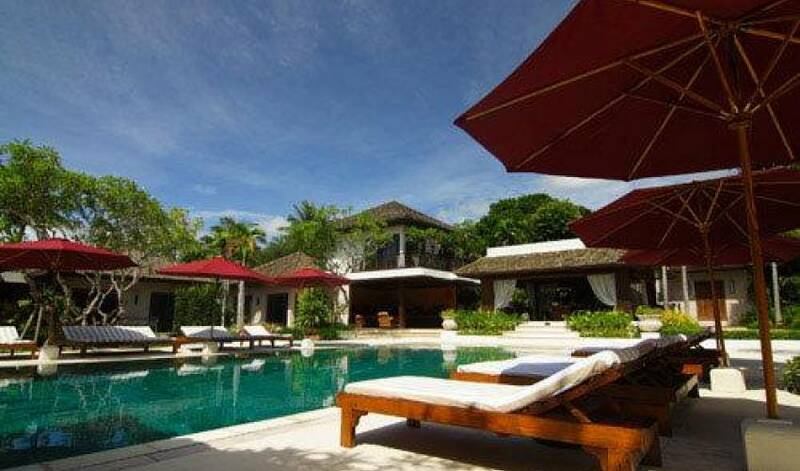 The Bali House (Sleeps 4), is a self-contained villa with 2 bedrooms, a living-dining room, and a kitchenette area. The design combines original Balinese temple doors and antique Indonesian furniture with contemporary accents and modern Asian style. 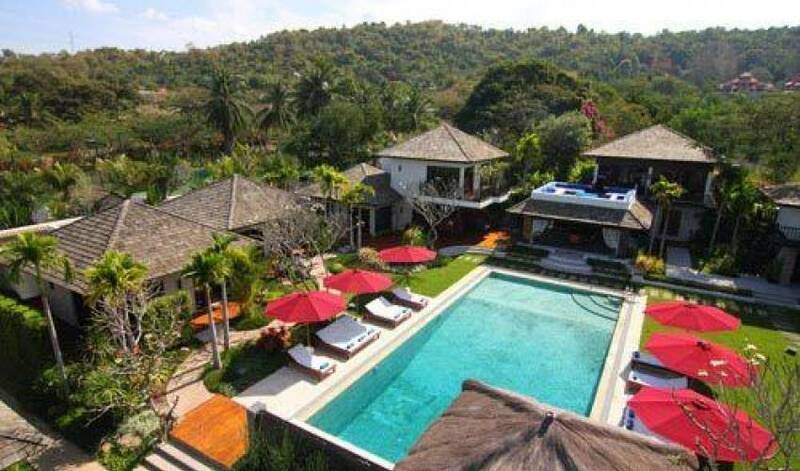 Main House (Sleeps 8), is a two storey fusion of Thai & Balinese architecture housing three bedroom suites, the TV/Cinema room (known as the Lava Lounge) and the main kitchen. 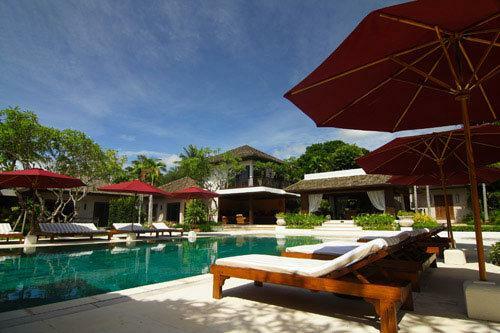 The 4 Pool Villas, open onto the swimming pool and the embracing pool patio. Each villa has high pitched ceilings and private en-suite bathrooms. 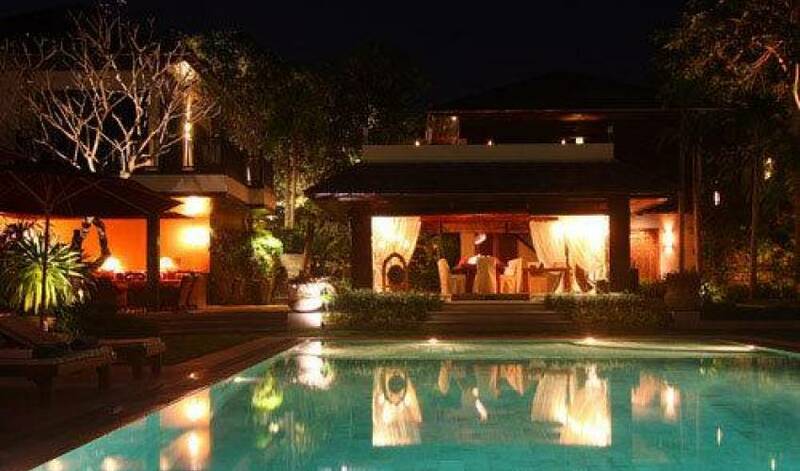 The Pool Villas, like all bedrooms have internally wired Bose sound systems, flat screen TVs, and wireless internet connections. 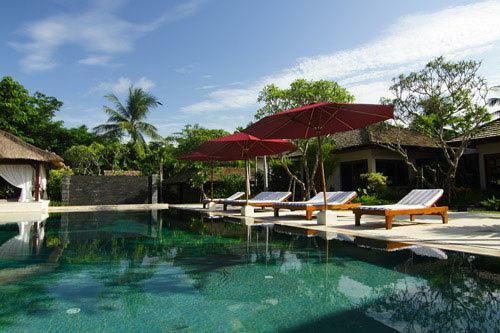 Clubhouse : situated 50 yards from the villa, and connected via a private pathway, is the original Buraran Estate clubhouse, which has been completely renovated and serves as a useful overflow for the villa guests. The spacious buildings contain 3 extra bedrooms (2 with King Beds and 1 with Twin Beds), a living room, a kitchen/dining area and 2 large changing rooms adjacent to its own 22 meter pool. The clubhouse can be used to provide additional bedrooms to sleep up to 6 people, and can be easily configured for seminars, meetings and other special events.